This past Thursday I went to Scullers to see the Steve Kuhn Trio with Special Guest Eric Alexander. It was an amazing experience, and left me very excited to play jazz. 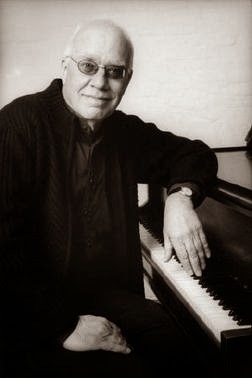 Steve Kuhn is a pianist, composer, and bandleader. He has played with many great jazz musicians such as John Coltrane, Chet Baker, Ron Carter, Stan Getz, Art Farmer, among others. He has a well known piano trio. Eric Alexander is a jazz saxophonist. He came in second in the Thelonious Monk International Jazz Saxophone competition, and since then he has been signed, recording records, and performing with many great jazz musicians like Ron Carter, Pat Martino, among others. The band came on the stage, and started with the Miles Davis song "Four", because, as Steve Kuhn explained, there were four people in the band. Other songs they played were "Mr. P.C. ", "Like Sonny", "Trance", among others. I enjoyed the song selections, they fit the band well. I liked Steve Kuhn's playing- it was quite different than many other piano players that I have seen live. What I liked about him was that he would leave a lot of space, and he never seemed to be compelled to just play something for the sake of playing something- everything he played seemed to have an intention. Kuhn alternated between dense chords, and single lines as well as alternating between the highest octave of the piano and lowest octave of the piano. In this way, his playing seemed to be centered around contrast. I also really liked how Eric Alexander played. He would calmly come on stage, close his eyes, and play his saxophone. He seemed to be in a "trance". Even when he played strings of fast notes, he would build them in such a masterful way- he would start quiet and get louder, or attack some notes more than others so nothing seemed like a straight line- it was always going somewhere new. I really liked his rhythmic sense- sometimes he would find a rhythm that really fit well, and he would keep on moving it to different notes, and develop his ideas. It was enjoyable to see him be rhythmic, and build his ideas, because then the band would act as a sort of call and response with him. The entire band communicated really well. Even if they were not outright talking to each other, you could tell they used different musical ideas to communicate where they were going with their solos, and they used call and response a lot. The bass player had great time, and his solos were melodic, and you could often hear bits of the tune in them. The drummer was very enjoyable to watch. He seemed to be having a great time, and he would smile and respond to different ideas the other people in the band were playing. Everyone in the band seemed calm, and radiated positive energy! Final Thoughts: I had a great time going to see the Steve Kuhn Trio with Special Guest Eric Alexander. It was a hidden treasure among concert lineups this month, and I am very happy I went to go see them! Is Sun Ra really from outer space?